This week brought us a chicken tractor. I had grand plans to build one myself, but when I found one on Craigslist, I decided to earn my carpentry chops sometime later and just get one that's already been built and already been loved. The person who sold it to us is a Landscape Architecture grad from UMass, who's done amazing things with his property. He also does tree work, and I just might be calling on him later to help me trim back some of these evergreen trees... Now that I'm ready with housing, I'm picking out chickens. More on that to come. We've bought a number of things from Craigslist recently--a rug, a table, a bird bath, and a chicken tractor. In each case, it was a real pleasure to meet the folks selling the item, to learn a little bit about the history of the item, and to wish each other well in our respective paths. It's been truly heart-warming. Everyone has their story, their particular slice, and to get a glimpse in and have a moment of friendly connection with strangers is humbling. We are all just trying to live a good life. Well, almost all of us--you do need to watch out for the occasional scam--I put an item on Craigslist the other day, and one of the responses offered to pay me more than I asked and to send me a check, and to send me money to cover the movers' costs...it was a bit suspicious, so I did a little research and found that this gambit is a typical scam. Someone sends you a (fake) check, often greater than the amount due, and then asks you to wire them back the overage. The check turns out to be forged, you are responsible to your bank, and somehow they get into your bank account through the wire transfer. I don't really know how it works. So--if you are going to use Craigslist, just do your transactions in cash and in person, and you'll be all set. I do know this guy pretty well--the Black Seaman tomato. All of the tomato plants have set fruit already, and I'm very excited to see them doing so well. The garden they are in now is partly shady, so I didn't have high expectations. But perhaps they will flourish and give us a few good bushels. We can hope. The peppers are a bit slower, but some of the plants are setting fruit. We should have a good crop of jalapenos, cayenne, and tangerines (sweet), at least. And the first flowers are appearing on the eggplants. Keep your fingers crossed... We made delicious Bangan Bharta, an Indian dish made of eggplants and peppers, and froze quart-size bags of it. There's only one bag left in the freezer, so I am hoping that we'll get a good crop and end up with brimming-full freezers once more. It's like that logic statement. If x, then y... All I can say is from my experience from the last few years: if the harvest is good, we will celebrate, and if the harvest is meager, then we will cherish what we glean. Last year, I lost most of the 250' row feet I planted of dry beans, and much of the 30 hills of dent corn I planted. 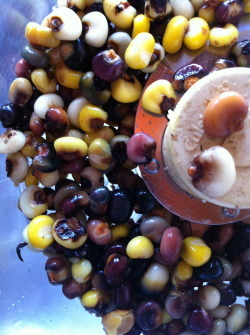 The plants grew so well, I was actually wondering how on earth I would ever shell the beans and corn at harvest-time. Turns out I needn't have worried. In the great rains that followed the hurricane last August, almost all of the beans moldered, hanging in pools of water that could not drain because the soil was so sodden. I tried walking among the plants, to see if I could lift them out of the puddles, but my boots sank 6 or 8 inches into the muck. The corn was fine, just inaccessible, and I figured I just had to wait a few days to retrieve it from the field. I ended up having to wait more than two weeks before the soil dried out enough to venture back in. And in the meantime, the deer got in and gobbled up at least half of the corn. But we did harvest some beans and some corn. And we appreciate them all the more, I think, because of our intimate experience with their story. I know what they went through and what I went through, and now they are in my hand, in my bowl, nourishing me all the same. With the corn, I make masa for tortillas or tamale pie; the beans are a staple for Anne's lunches, packed in tiffins and brought to work. This year, we are only growing tomatoes, peppers and eggplants. What's in the garden now will feed us and give us great pleasure, though we'll have to rely on the supermarket much more than in the last few years. But I can see a larger garden emerging, just beyond the edging, right where that sod is now. Next year, at this time, the lawn will be full of plants and flowers, and we will walk among them with hearts full of happiness and hope, wondering what the harvest will bring.